As a homeowner or even an apartment or condo owner, hiring is a plumber is not something to be taken lightly. If you don’t hire a plumber who delivers quality work then you are putting yourself at risk for high cost repairs that will be needed in the future and even potentially dangerous situations for yourself and your family. Quality is of the utmost importance as is experience. You don’t want somebody repairing some of the most important parts of your home like the toilet, and water heater if they don’t really know what they are doing! 1. Make Sure They Have Superb References! The number one thing I always recommend to anybody looking to hire a plumber is to make sure that they have wonderful references from previous clients who have hired them before and are more than satisfied with the job performed. If a plumber has little to no references they aren’t likely to be very good or very experienced. A good plumber will go out of his or her way to ask satisfied customers to leave good reviews somewhere like Angie’s List or Yelp so future clients can see that they are hiring a well-known and liked plumber who knows their stuff! This is a big one and all plumbers should be insured and in most cases bonded as well. Making sure that somebody who will be working on your property is insured will protect both yourself and the plumber in the event of an accident or injury and no nasty lawsuits need to be filed. All good and reputable plumbers should guarantee their work including all of the parts they have used to do the job. 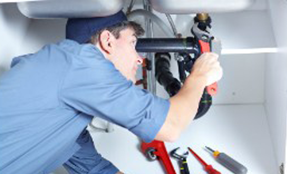 Most warranties will hopefully cover any work the plumber has done for you up to a year after the job is finished. If the plumber you are looking to hire refuses to guarantee their work, then definitely look for somebody else, because if something breaks and it is not covered under warranty than you will have to pay more to fix it, not worth it. Especially when there are plenty of plumbers out there willing to guarantee their work for a certain amount of time and help if anything goes wrong after the job is completed. This should really go without saying but I’ll say it anyways, most states require that a plumber holds a license to practice in that state, although the outliers are New York and Kansas. If your state does not require a plumber to be licensed before they can legally does a job then make sure that there have been no formal complaints filed against your plumber that you are considering to hire? This can be a telltale sign to know if there will be trouble ahead if you choose to go with this particular plumber. These are the most important things to look for when hiring a plumber and don’t skip any of these steps as they can cost you more money down the line then you need to spend!